I just made a page. And it was a page for myself and not for work! Isn’t it amazing what a woman’s body is capable of? Despite the aches and pains, I am amazed by the form my body takes when I am pregnant. I am aware of the blessing it is. What a thrill it is to be entrusted by God to give life to a spirit so fresh, innocent, and so full of promise. My prayer is that I will be able to be a mother to this baby that God has entrusted me with. Here's a little secret. 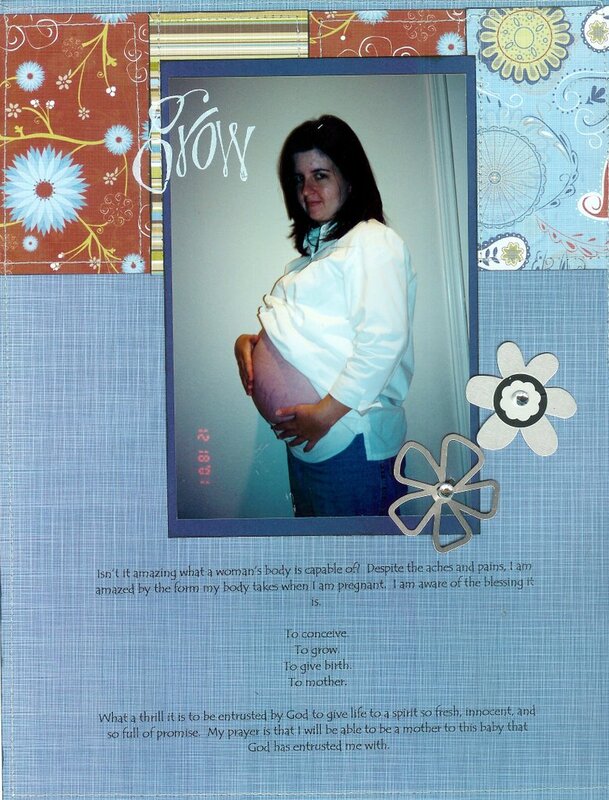 That picture was taken almost 5 years ago on December 11, 2001 when I was pregnant with Ethan. I feel like history is repeating itself! Now hopefully I can finish Ethan's baby album before this baby is born. Oh, and we are having record highs today. The temperature as of now is 80 degrees. Texas hasn't had this high of a temp since 1998 for November. I wish I were in Utah!